Saponified cold, the Gaiia The Gourmand Vegan Scented Surgras Soap is a real caress for the skin. It gently cleans the epidermis and protects it from external aggressions. Thanks to its creaminess, it leaves your skin soft and hydrated. Its richness in vegetable oils and glycerin brings an immediate comfort and avoids the sensations of tightness. Its delicate gourmet smell reminds us of cakes with cinnamon and sweet orange. Comforting, it offers a real moment of sweetness. Respectful, Gaiia Vegan Scented Surgras Soap is suitable for all skin types. 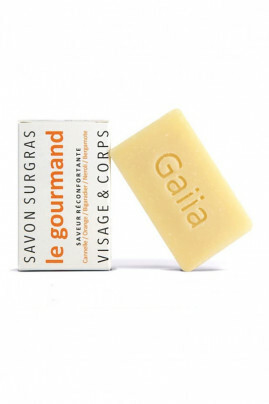 The Gaiia The Gourmand Vegan Scented Surgras Soap for a naturally hydrated skin. Ecological, Gaiia cold soap replaces several cosmetics that are usually found in a bathroom. It cleans the body and face as well as the hair like a real natural shampoo. For shaving men, it can be used as a beard soap. As a natural makeup remover, it removes all traces of makeup for a perfectly clean skin! Natural essential oils for a soap saponified cold! Sodium olivate, Sodium rice branate, Sodium cocoate, Aqua, Glycerin, Sodium castorate, Cinnamomum zeylanicum leaf oil, Citrus sinensis peel oil, Citrus aurantium bergamia fruit oil, Citrus aurantium amaranth peel oil, Citrus aurantium flower oil, Limonene, Eugenol, Linalool Benzyl benzoate, Cinnamal, Geraniol.